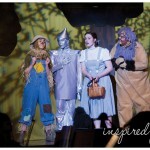 Wizard of Oz was a magical performance. Props to those behind the scenes, the directors, the students of West High School and the adorable elementary students who all put in long hours to make the show a success! View the full gallery of the show by clicking Clients > West Musical Production.